Yamaha, one of the famous Japanese Trio gave its gem to the Indian market nearly 3 decades ago. The RX-100 was the best a company could do with a small sized engine and conservative styling. Built with a 98 cc engine, the 2-stroke machine was a pocket rocket. 30 years are here to finish but the demand still remains fresh as everyone wish to have a RX-100 with them, making it the most desired, but not practically possible used bike in India. With its lightweight body and high power output, the power to weight ratio of the bike made it the best 100 cc bike ever built for mass production. The engine of the RX-100 produced a maximum of 11 BHP and 10.39 NM of torque, which were definitely the power values of a 125cc or 135cc machine. The weight of 95 kg made it more responsive and the bike successfully made a 0-400 meter run in 14 seconds. Some people even say that the top speed of 100 kmph made some of the authorities worry that if Yamaha has plonked a high displacement engine (more than 100cc) in the bike, which was then opened and tested, resulting in a 98cc engine. This would have been a really proud moment for an automaker and Yamaha continued its legacy from that day to the present. The production of the bike started with CKD kits assembly for the first year and manufacturing of the bike here from the following years. It was sold from November 1985-March 1996. The Made in Japan written on the engine is one of the most valuable models of the RX-100, even being sold for approximately INR 90,000 on OLX. The range generally starts from INR 9,000 and goes up to INR 50,000 for the fully restored models. Its approx. price back in 1987 was INR 19,764, which equals more than 3 times when calculated according to the current value of money. People still love the bike more than anything else, which is why spending a lot of money on its restoration never pinches a RX-100 fan. The bike normally has much more amount of money spent on it than its original value and this makes the India's first motorcycle love a very special one. 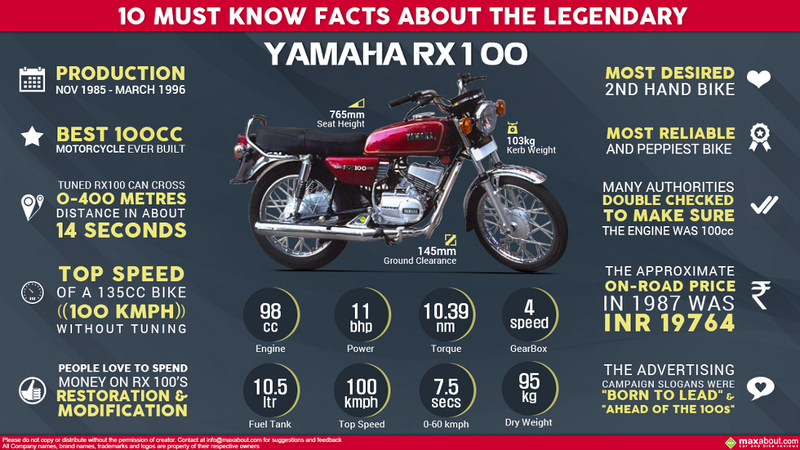 The advertising campaign slogans of RX 100 were - "Born to Lead" & "Ahead of the 100s"
Click here to know more about Yamaha RX 100. Downloaded 150 times this week.